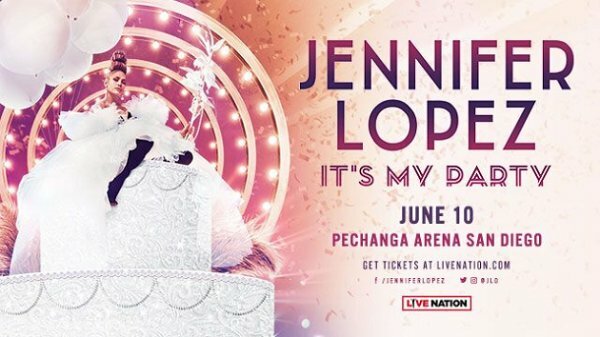 Jennifer Lopez "It's My Party Tour" at Pechanga Arena on Monday, June 10, 2019 in San Diego, California. Get your Jennifer Lopez in San Diego tickets. "It's My Party Tour" To Celebrate Milestone Birthday with Fans. Tour opens on June 7th, 2019 in Los Angeles, California. LOS ANGELES, CA (Mar 22, 2019) via Live Nation - Today music and entertainment powerhouse Jennifer Lopez revealed details of her highly anticipated It’s My Party Tour, her first ever US headlining tour. To celebrate her birthday, the multi-hyphenate entertainer will bring an all new show to fans in 25 cities across North America this summer. Produced by Live Nation, the It’s My Party Tour will kick off June 7th in Los Angeles, CA and make stops in Houston, Chicago, Atlanta, New York and more, before wrapping July 25th in Miami, FL. Fans can anticipate a signature Jennifer Lopez show each night - the It’s My Party Tour will feature a nonstop party mix of Jennifer’s new and classic anthems, show-stopping choreography and dancers, dazzling wardrobe, jaw-dropping technology and set design, and all of the glamour and wow-factor fans have come to expect of Jenny from the Block.